Many growers want to see their revenge. They want to witness the death of the pests that have been plaguing their gardens. 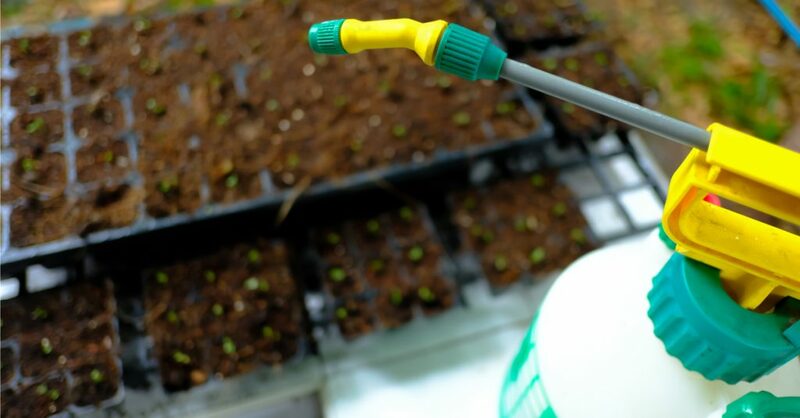 In order to get this instant execution, you have to use pesticides that will end in a buildup of toxic chemicals around your plants, in the soil, and more. This use of poison can get deep into your garden and eventually cause problems with your ecosystem from killing off beneficial insects to helping the pests you’re trying to kill build up an immunity to the pesticides. This is where neem oil can come into play. It’s nontoxic to people and animals. It won’t build up in your environment because it’s biodegradable, and doesn’t cost an arm and a leg. Neem oil is your best choice when it comes to indoor growing operations and backyard gardens. Click here to try a FREE bottle of our own Mantis Cold-Pressed Neem Oil! You may be wondering how does this miracle organic pesticide work? Let’s go over the chemical makeup and ingredients. Neem oil comes from the Azadirachta indica which is also known as the neem tree, Indian lilac, or the margosa. This amazing tree is found in many Asian countries and other tropical areas where it can live for 200 years. It is heat tolerant and drought resistant. Neem oil comes from this tree’s seeds and has been used by man for not only organic pesticides but also as a medicine for thousands of years. The best method used to extract this oil is by cold-pressing the seeds. 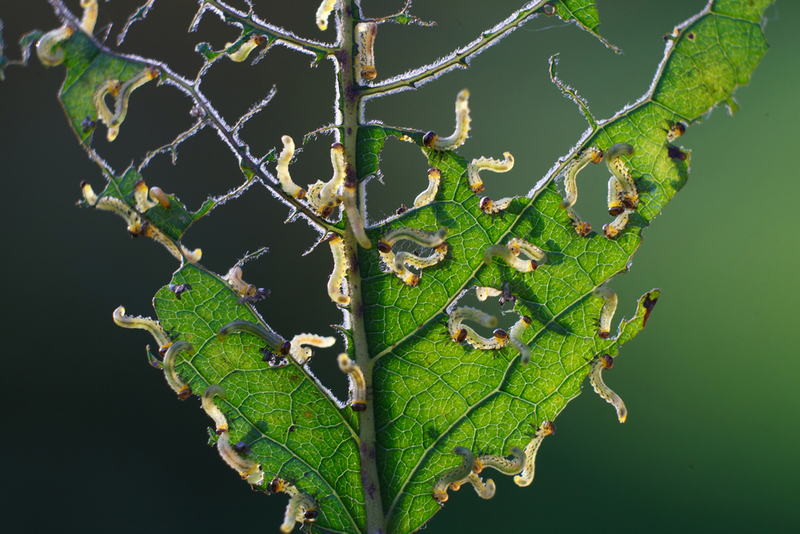 While neem oil is not the ultimate pest killer, it can help to repel them, stop their larval development, delay growth, impact fertility, and be a deterrent to pest feeding. Rather than acting as a traditional pesticide, it will mess with the insect’s hormones. These hormones are what tells the insects to mate, lay eggs, eat, and more. This disruption in their hormones will effectively help to make them less of a problem. In addition, once this oil is applied to your plants, it also has antifungal properties that will prevent fungal spores from germinating. 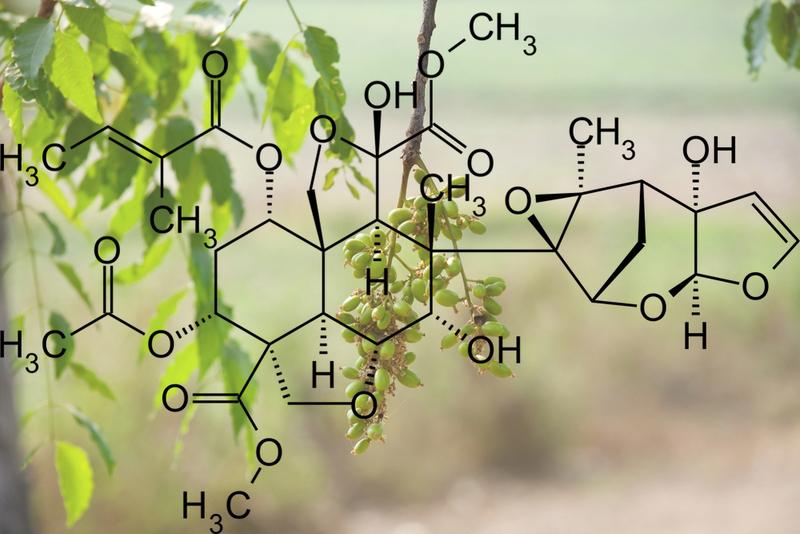 The complex chemical structure of azadirachtin makes neem oil virtually impossible for insect resistance to develop. 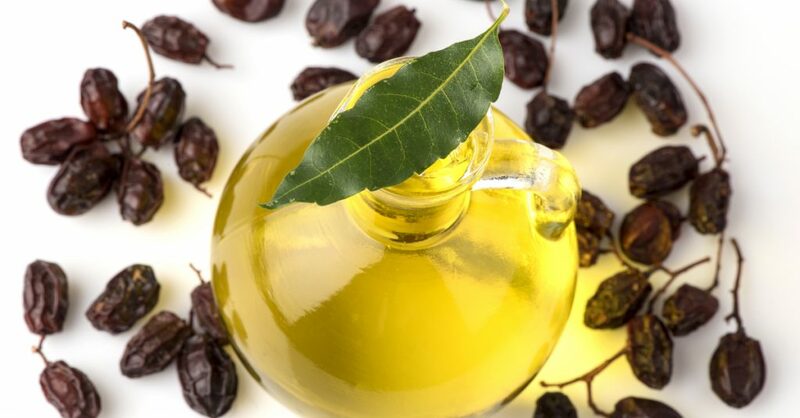 Neem oil that is pure will contain Azadirachtin, stearic acid, oleic acid, linoleic acid, palmitic acid, triterpenoid compounds, campesterol, beta-sitosterol, and stigmasterol. The different components that make up neem oil have not all been researched, so the exact role they each play is not known yet. The main component that has been more thoroughly researched and helps neem oil act as a repellent and stops insects from feeding, laying eggs, and growing is the triterpenoid, azadirachtin. 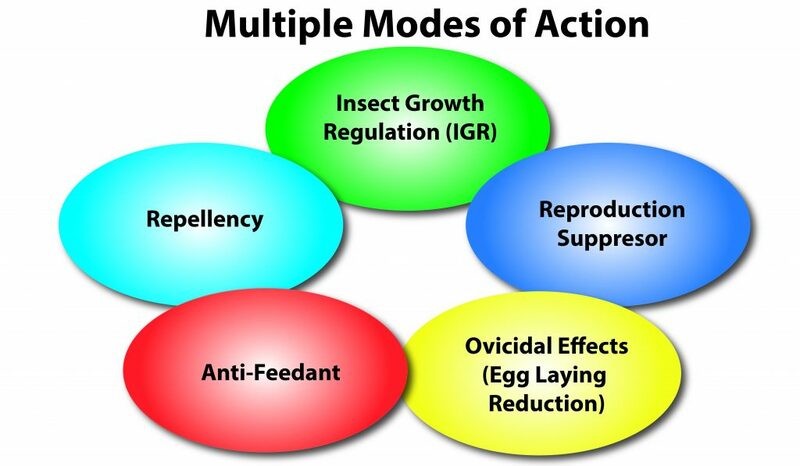 This is what breaks the cycle of an insect’s typical life that helps to eventually eliminate them from your garden. There is about 300 to 2500 parts per million of azadirachtin in neem oil, and this amount is often dictated by the quality of the seeds used to create it and the method the neem oil is extracted from the seeds. Another triterpenoid that has been found to offer antifungal, antiseptic, antihistamine and antipyretic properties is Nimbin. What does Neem Oil Work On? There are a number of pests that neem oil will repel. The good news is that it doesn’t harm beneficial insects such as earthworms, butterflies, ladybugs, and honeybees as long as you’re not putting it on their food sources or habitat. 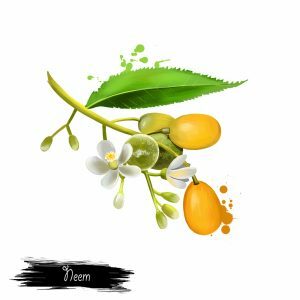 Why is it Important to Use Pure Neem Oil? You may have seen some neem oils available that are labeled Clarified Hydrophobic Extract of Neem Oil that are usually even cheaper than pure neem oil. It’s fine to go with this, right? Actually, you’re much better off finding a pure neem oil. The cheap knockoff might be a good bargain, but you have no way of knowing how the chemical makeup that makes neem oil so effective and biodegradable in your garden is the same. Stick with a neem oil that is labeled as 100% pure neem oil to get the results you expect from it. P.S. Ready to try some neem oil yourself? 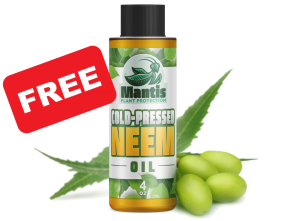 Click Here to claim a FREE bottle of Mantis Cold-Pressed Neem Oil today!